Lifeline Interview with Amy Phillips, Product Manager with Hedrin on the current campaign to highlight the problem of headlice. 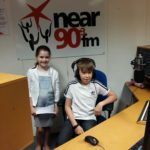 Michael Hennessy speaks to Amy Phillips, Product Manager with HEDRIN, on the topic of head lice and how she wants to get parents to “Spread the Word & Not the Lice”. Amy advises parents to “take a Peek once a week” and they can catch head-lice early and prevent their spreading. She particularly asks parents not to be secretive or embarrassed by this very common problem, which has nothing to do with hygiene. Nonetheless, one in three parents have kept their child’s head lice a secret , while 78% of families experience at least one outbreak of head-lice in one year.